Australia is the largest island continent in the world, with a total area of over 7,600,000 sq km, lying south of the Equator between the Indian and South Pacific Oceans. The population is approximately 19.5 million, with a growth rate of about 1%. The majority of the population (85%) resides in urban areas along the east and southeast coastline and fertile plains. Much of the interior of the country is flat, barren and sparsely populated. The highest point, Mt Kosciuszko reaching 2,229m, is within an extensive mountain range running north south along the eastern seaboard. Australia also lays claim to the third largest marine jurisdiction in the world and has a coastline extending more than 36,700km. Australia was colonized in 1788, although was inhabited for over 40,000 years by the indigenous Aboriginal peoples. Australia has been an independent member of the British Commonwealth since 1901 when it became a Federation of States. A referendum to change Australia's status from a Commonwealth headed by the British monarch to a republic, was defeated in 1999 and hence Queen Elizabeth II of England remains the Head of State. The constitution vests in the Governor-General, representing the Head of State exercised by tradition on behalf of the elected government. The Government is based on a bicameral Federal Parliament headed by an elected Prime Minister consisting of a Senate which has proportional representation among the States. The Federal Government has powers over defence, foreign affairs, trade and commerce, taxation, customs and excise duties, pensions, immigration and postal services. Other powers are left with the States, such as health, education, state transport networks, town and rural planning and land administration (cadastral system, land registration). Although inhabited for over 40,000 years by the Aboriginal peoples, their land rights did not gain legal recognition until 1993 with the introduction of the Indigenous Native Titles Act. The development of the Australian cadastral system was not influenced by the land ownership systems or patterns of the indigenous peoples. Instead from the initial colonization period of 1788 Australia began adopting the English system of deeds registration for land transfer. It was not until the mid 1850s in the colony of South Australia that Robert Torrens introduced the system of Certificate of Title to simplify land transfer, which had become expensive, complicated and inefficient. By 1874 all States of Australia had adopted the “Torrens System” of title registration. Settlement surveys were hampered by harsh terrain, unrecognizable land marks, rapid settlement and a shortage of professional surveyors leading to a sporadic approach to surveying and a lack of survey control. Cadastral maps were based on isolated surveys of Parish areas at a scale of 1inch to 20 chains, primarily for registration of private title (freehold land) and reservation of Crown land. Certificates of Title were registered at a central Land Titles Office in each State where details of mortgages, easements, covenants and leases are registered. As a Federation of States, Australia maintains centralized land administration offices in each State, which are almost completely computerised today. There is no prescribed organizational structure common to all states. Land administration is a state government responsibility under a range of government departments such as Environment, Planning, Information Technology or Land Administration. Embedded in these departments is a digital map of the state including the state’s digital cadastral map, Land Registry and Titles Office, Crown Lands Management Office, Surveyors Board, and business units for Land Information and Resources. Combinations of these services can be found in all the States, integrated through sharing agreements and often residing in the one central metropolitan office. A consortium of all states and the Commonwealth, called the Public Sector Mapping Agencies Ltd, produces national cadastral map products. Most cadastral surveys are undertaken by the private sector. Qualification of a license or registration for surveyors (depending on the state) is required to perform cadastral surveys, however other surveys such as engineering surveys do not require this. Management of the geodetic network remains primarily a government responsibility, however updating and upgrading is often outsourced to the private sector. There is a strong embodiment of professional organisations in Australia of which the main one is The Surveying and Spatial Sciences Institute (SSSI) comprising of around 2,800 members. There is a Division in all States and Territories. SSSI is represented in the International Federation of Surveyors (FIG). Also at a national level, surveying and mapping coordination and cooperation is provided by the Inter-governmental Committee on Surveying and Mapping (ICSM) represented by Australia’s Commonwealth, State, Territory and Defence surveying and mapping agencies. The Australia New Zealand Land Information Council is a joint “Spatial Information Council” initiative of the Australian Government, the New Zealand Government and the governments of the States and Territories of Australia. Their role is to facilitate easy and cost effective access to spatial data and services provided through public and private sector organisations. The private sector survey industry interests are promoted and represented by the Australian Spatial Information Business Association (ASIBA). The Australian Spatial Industry Education and Research Association (ASIERA) is anticipated to fulfil the same peak body and lobby group role for the academic and research sector that SIBA performs for the private sector. Surveyor’s or Survey Acts and Regulations in each jurisdiction identify guidelines for licensing and registration of cadastral surveyors and the undertaking of cadastral surveys. Under the Reciprocating Surveyor’s Board of Australia and New Zealand persons registered by a Board in any State of Australia or New Zealand, can apply for registration in any other State of Australia or New Zealand under a reciprocity agreement (Mutual Recognition Act 1993). A person applying for registration must be issued with a certificate of competency in cadastral surveying which typically requires 12 to 24 months under a training agreement with another registered surveyor and in addition must pass some further professional examinations and practical exercises supervised by the Board of Surveyors. To enter training agreements persons are required to hold a degree approved by the Board of Surveyors. Surveying programs are offered at nine universities, in 6 jurisdictions of Australia, as a 4-year bachelor degree of Geospatial Science, Geomatics, Geomatics Engineering, Spatial Information or Surveying. The degrees offered, increasingly covering broader topics of spatial information, have maintained the prerequisite for entering the professional field as a registered or licensed surveyor. There has been a trend to University departments in other areas such as Geography to also offer programs in spatial information science, however these programs are not recognised by the Surveyors Registration Boards. Current student numbers graduating annually from Australian universities is approximately 300, with about 40 graduating postgraduate students involved in surveying or related spatial research areas. About 30% of students studying at an undergraduate level are women. The cadastral systems in Australia were historically designed for the transfer of land ownership in a legal land market. Secondly the cadastral system supports the legal ownership of land, and defining, identifying, demarcating, measuring and mapping legal parcel boundaries. Due to the high integrity of the cadastral system it now plays a more fundamental role in broader land administration activities, as the core spatial data set in spatial data infrastructures (SDI). Through the computerisation of spatial and textual data the cadastre now serves a multi-purpose role supporting many activities. These include supporting an active land market, valuation of land and land taxation, land management and planning, land development, local government and utilities management, emergency management and many other multipurpose functions. Historically a parallel system of land registration developed for the mapping, surveying, management and administration of public and private lands - Crown Lands administration and Land Registry respectively. Through computerisation of all land data these two mapping systems are undergoing integration to facilitate wider land management and environmental planning. Today the aim is to delegate one government agency with the responsibility of maintaining an up-to-date cadastral map of all land parcels connected to the land registration function, with land use management and administration usually remaining with the custodians. The Australian cadastral system supports legal land parcel identification of public and private rights. Cadastral systems are not consistent across the continent, as each of the 8 jurisdictions operates and maintains their own form of cadastral system. This includes 8 variations of the Torrens system, with the titling and registration differing slightly in each jurisdiction. Cadastral systems in Australia are operated by the 8 state administrations and operate in such a way that land parcels are surveyed in the field while the corresponding land ownership titles are recorded in the Land Registry. The Land Registry uniquely identifies each parcel corresponding to the title. The relationship between these two main units is usually a 1:1-relationship, i.e. each land parcel is usually related to one land ownership entry in the land registry. The term "property" is used by the local councils and utilities, which maintain property records for their own planning and tax purposes. A property has one street address and usually one house, but can consist of one or many, normally adjacent parcels owned by the same landowner, especially in rural areas. In about 90% of the cases, however, a property consists of one parcel only. While the land ownership title is of interest to the land registry, the term property is used by the local councils and reflects their different needs. Buildings are part of the property records with records maintained by many local councils as well. In some states, if registered land is adversely occupied for a continuous and uncontested period of at least 15 years a person may apply for adverse possession. The title can then be changed to reflect what is on the ground. In some states there is no adverse possession. Textual Component – the land register identifies real property parcels, which includes all land parcels and identifies owners’ rights, restrictions, and responsibilities, ownership, easements, mortgages etc. Fixed boundaries are those with legally surveyed measurements used to precisely identify most parcel boundaries determined by cadastral surveys such as subdivision etc. General boundaries (graphical) are not survey accurate and are based on natural or man-made physical features, such as High Water Mark, or walls and buildings as found on Cluster or Strata Titles. Additional legal, valuation, local government, utilities and planning activities are involved in land administration, and are heavily reliant on the fundamentals of the cadastral system. In particular local government rates, land tax and stamp duty (as a result of land transfer) on land parcels is a major revenue raiser for the economy. The cadastre covers approximately 10.2 million parcels including freehold, state owned land, strata titles and a very small number of Native Title parcels. The present day cadastre is now digitised throughout the country with all jurisdictions having completed the digitisation process of all land parcels. The graphical representation of land parcels is typically known as digital cadastral databases (DCDB). The integrity of the graphical DCDBs are supported by survey plans and field notes with legal measurements or graphical measurements in a digital parcel-based data set. Both the computerised land register and DCDB in each state or territory are updated daily. Services to view and print cadastral information in most states are available via the Internet for a fee or available for purchasing through licensing agreements although the digital cadastral map is available free of charge via the Internet. A seamless cadastral database called ‘Cadastral Lite’ integrated from each of the jurisdictional data sets, co-ordinated on the GDA94 datum is available. See the http://www.psma.com.au/cad.html website for an example. The current cadastral map (or DCDB) in all states and territories is usually based on a graphical representation of geometric components in electronic format. As mentioned, all jurisdictions are self-governed and have established different solutions, data models and processes for their digital cadastral data systems. An example is given of a State DCDB using the state of Victoria. The DCDB is known as Vicmap Digital and the main cadastral data is derived from the ‘Property Metadata’ set. This was developed by hand digitised base maps in urban areas at scales of about 1:500 scale. The rural areas were created using conventional parcel-based lines, by compiling, plotting and then hand digitising parcel detail from Parish, Township, subdivision, and road survey plans and using overlays of orthophoto maps. Compilation was mainly undertaken at 1:2,500 in densely populated areas and 1:25,000 in the remaining rural areas. These digital cadastral maps are under the control of Land Victoria in the Department of Sustainability and Environment. Private land surveyors and many government agencies continually input cadastral detail validating and improving content regularly. The Victorian dataset series contains data primarily representing Victoria's land parcels and properties and is used extensively in Geographic Information Systems (GIS) by the public and private sectors. The content includes parcel polygons, proposed parcels (future development), parcel identifiers, municipal council reference numbers, road centre-lines, road easements and Crown and freehold land differentiation. Each of the data features is date stamped and uniquely identified. Updates are available as whole file replacement or incremental (changes only) files with maintenance ongoing daily and incremental updates available fortnightly. 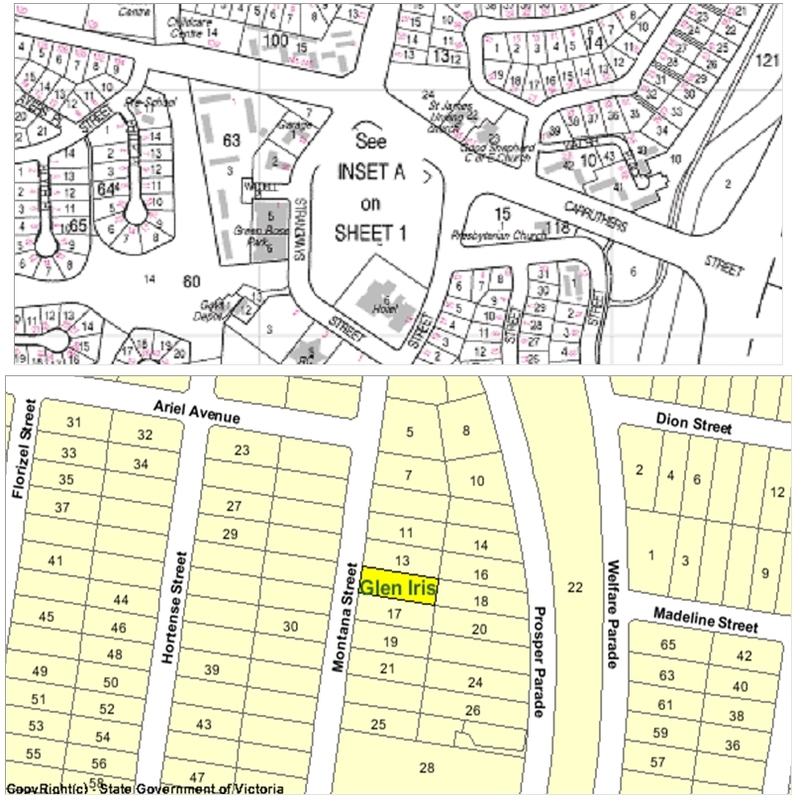 Below are two examples of the different digital cadastral databases from the Australian Capital Territory (Fig. 1) and the Victorian Digital Cadastral Map Base (Fig. 2). The data sets vary between each state and are graphically represented with slight differences. Some show parcels, addresses, buildings, unique identifiers, street names, geographic nomenclature, dimensions, coordinates etc, while others show lesser details. Figure 1 (above): Australian Capital Territory Digital Cadastral Database – survey accurate. Figure 2 (below): Victorian Digital Cadastral Mapbase (DCMB) – graphically accurate. The development of Spatial Data Infrastructures (SDI) has increasingly recognized the inherent role of linking land parcel components as the fundamental layer underpinning the SDI model. The data is all linked to standard parcel identifiers in the cadastral layer correlating information from each of the data sets. Core data sets of the SDI are organised as layers which include: Geodetic Network, Cadastral Framework, Topographic Coverage, Road Network, Address System, and Geographical Nomenclature. Gradually additional data sets are being integrated as sharing, privacy and format issues are overcome. These databases include features of Soils Type, Vegetation, Minerals, Fauna Distribution, and Hydrography. Due to the large databases and detailed information stored, the cadastral layer as a framework is also playing a major role in providing accessibility to land information from the broader perspective of land and utilities management and spatial analysis. The DCDB and components of the SDI are also becoming increasingly significant in a wide range of social, environmental and economic activities. Because the two systems historically are surveyed, registered, administered and managed separately, the integration of the two in one seamless cadastral map and title register is a major task. The vision of a complete cadastre is accepted but achieving it is difficult. Electronic and online conveyancing and registration services, such as the digital lodgement of subdivision plans and the transfer of title are major challenges. However there are concerns and risks involved with issues of privacy, identity and fraud. Online land transfers aim to take away the necessity of ‘over-the-counter’ dealings, reducing time and cost, however this takes away the necessity to be holding a certificate of title, which at present is the only state guaranteed proof land ownership document. Recent iniatives include the conversion of paper plans to .pdf format for electronic lodgement with local government for approval. The next level of development is the digital lodgement of plans of subdivision to land registries in each of the states and territories, and at the time of writing this country report was underway. The proposed implementation of e-land administration projects have highlighted the need for an improvement in the accuracy of the digital cadastral map bases in each of the jurisdictions from mapping accuracy to survey accuracy. This will improve the integrity and accuracy of the cadastral map layer within the SDI. Because the development of Australian cadastral surveying was ‘piecemeal’, created from isolated surveys, the move to adopt a full coordinated cadastral survey approach is a challenge although most jurisdictions are well on the way to achieving this goal. Water shortages and reduced river flows have led to the total allocation of water rights being reduced. To implement this, the various jurisdictions have created water titles that can be traded separate to land parcels. This has involved establishing water registries to administer the transfer of these rights. Much attention is currently focussed on the dissemination of spatial information through spatial data infrastructures (SDI). SDIs have evolved out of and rely on a state's or a country's land administration system and are the key infrastructure in enabling land to be efficiently and effectively administered. The evolution of technology increasingly offers more avenues for this to occur. Internet and Wireless Application Protocol (WAP) technologies are providing a lead to accessing the complex digital environment in SDI. There are ongoing projects in each jurisdiction. In a federation of states where each jurisdiction is responsible for their own development, there are a whole range of differences such as interoperability, jurisdictional responsibility, privacy, cost recovery, custodianship and access. This inhibits the development of national large scale spatial data sets. The Council of Australian Governments meetings bring together ministers from each jurisdiction and provide opportunities for national projects to provide consistency in cadastral systems. A national project called “e-Plan” is being implemented across each of the jurisdictions. This involves a consistent approach and specifications for the digital lodgement of plans of subdivision at land titles offices. The lodgement requires the land surveyors to convert plans of subdivision and supporting survey information to landXML format. When fully implemented the land titles offices will have the capacity to visualise the landXML files and provide prints as required. The benefits of this process is that the registration process will be streamlined, new registry processes will be possible, and the cadastral surveyors will have access to the latest digital cadastral map data.